You may have been wondering, what is all that activity going on across from the feed mill downtown. 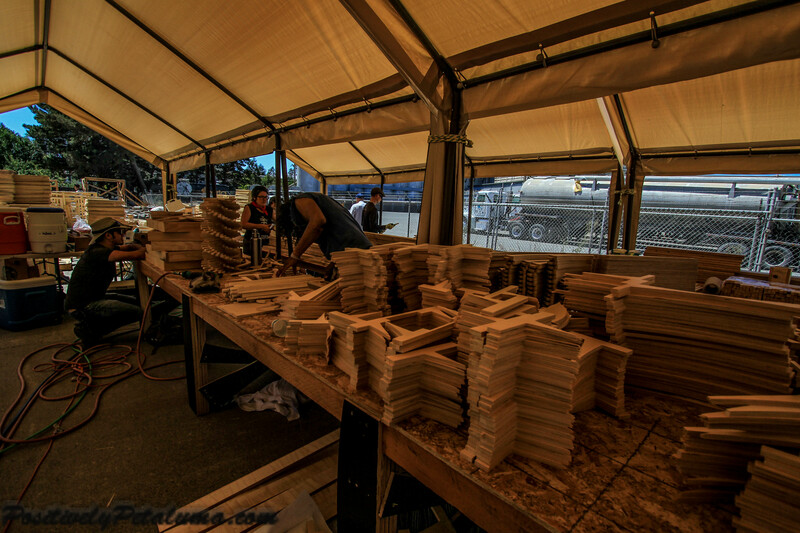 There was about 40 people working under several tents surrounded by wood material. Over the sound of hammers, nail guns, and saws people were busily communicating and working in concert to build something. A woman stepped out of her car in front of me as I was looking on. I asked her what they were doing. She told me they were building the Burning Man Temple. I asked if it was “thee” Burning Man Temple? And she replied “Yes”. 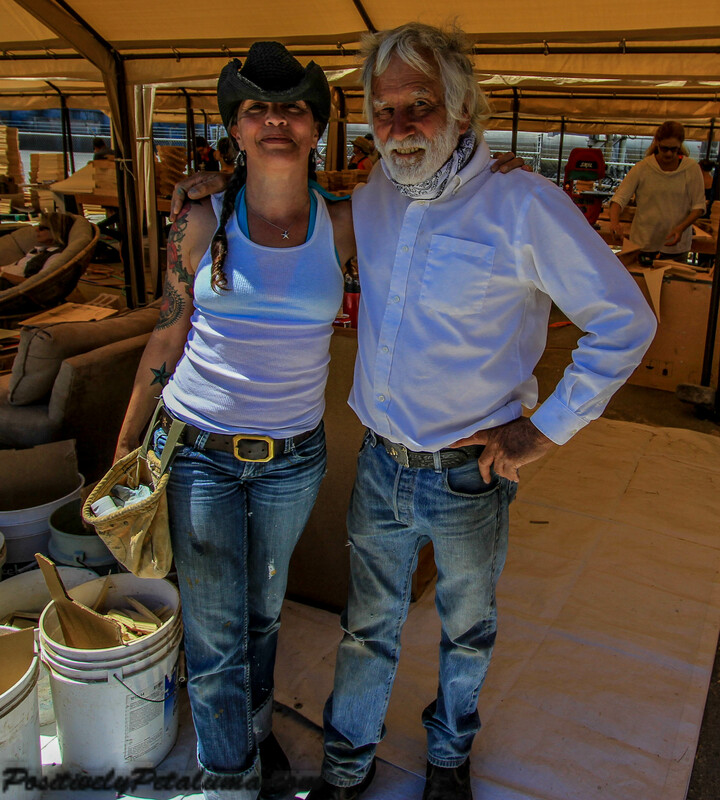 I was talking to Jules Mancilla, aka “Little Wing”, who seemed to be like a foreman on the job. However she told me that no one is really in charge. The people come together and work to build the structure. Burning Man is a week-long annual event held in the Black Rock Desert in northern Nevada. 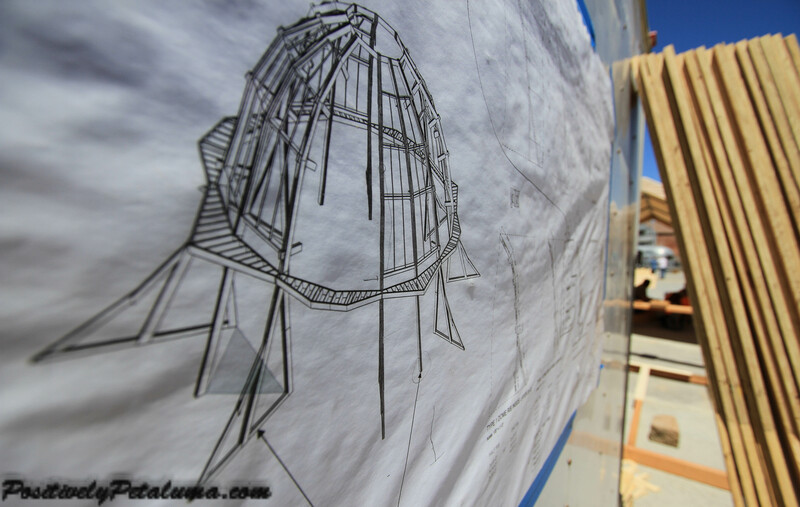 This is the first time this structure will be built in Petaluma. However it won’t be the first time this structure was built by a Petaluman. The man in charge is David Best from Petaluma. David started building the temple in the year 2000 and has become a legend for Burning Man attendees. Since then the event has grown so large that permits limit to sell 70,000 tickets that are sure to sell out and a lot of people will be disappointed that they will not be able to go. 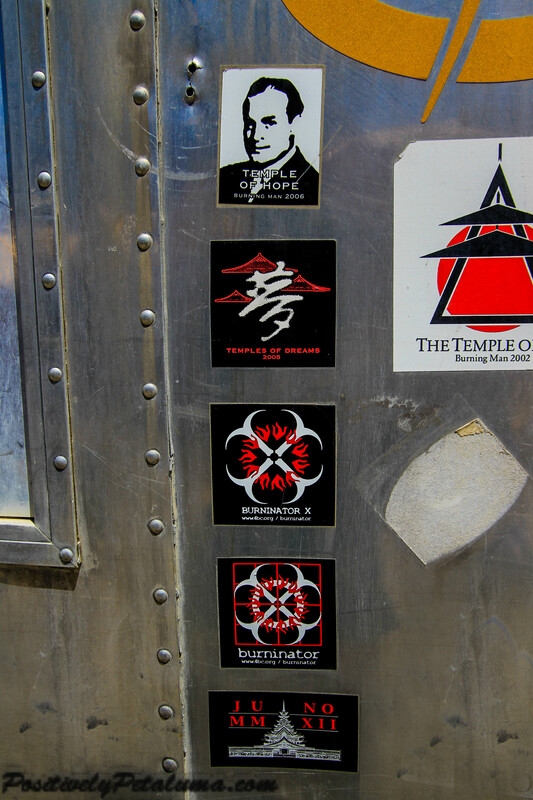 The pictures to the left are stickers of the past years temple’s affixed to his small Airstream trailer. The materials of this structure are all recycled or wood that had been discarded. 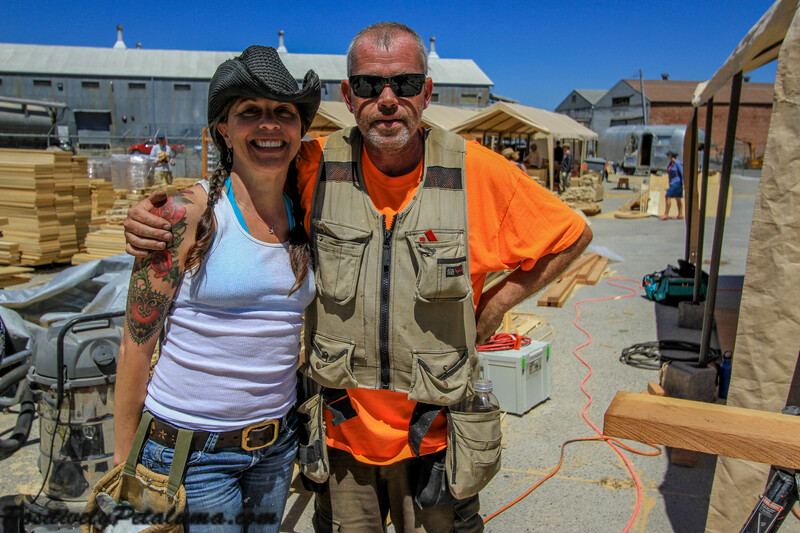 Jules explained that it is all bare wood that cannot be finished or stained so it won’t emit fumes when they burn on the last day of the event. The cost of building this structure is purely by donations. You can donate any amount of money to help with this project by going to their Kickstarter campaign. Jules explained that no amount is too small – people donate small amounts and that is equally appreciated by all. The structure will take 14 days to build. Then after they build it, they tear it apart into sections. Several sections will be loaded on trucks and hauled to the event site. They will be the first ones on ground and will survey the land with GPS technology to determine where the structure will be placed. They put it back together, and then cover the outside with detailed skins to finish it off. This structure was dedicated to one of the original builders of the structure who passed away in an accident. Since the dedication, many people who have lost loved ones volunteer to build the structure as they view it as a memorial. Also others look at the temple as a way to start a new life together, and couples get married on the structure during the event. So the temple has become more than just a pile of wood in the middle of the desert for a really big bonfire party. It is symbolic and has meaning for many. Per Wikipedia the 2014 structure will be the Temple of Grace intended to be a spiritual and sacred space for memorials, reflection, celebration, and to commemorate life transitions. The structure incorporates a central interior dome within a graceful curved body made of wood and steel. 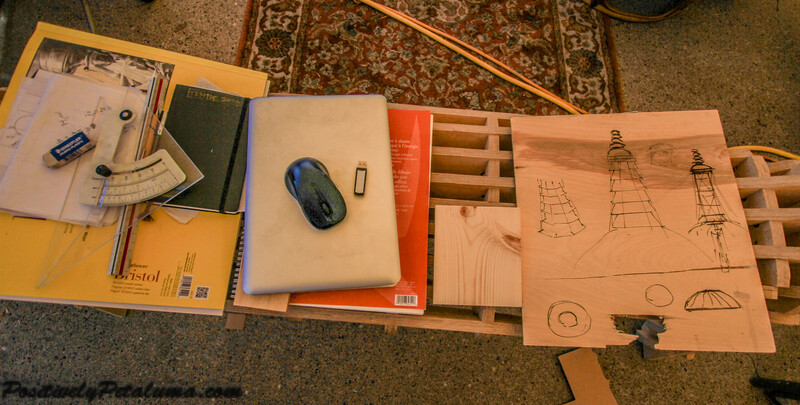 It will again have intricately cut wooden panels for the exterior and interior skin. 8 altars will surround the temple inside a low-walled courtyard, creating a large exterior grounds for the community. 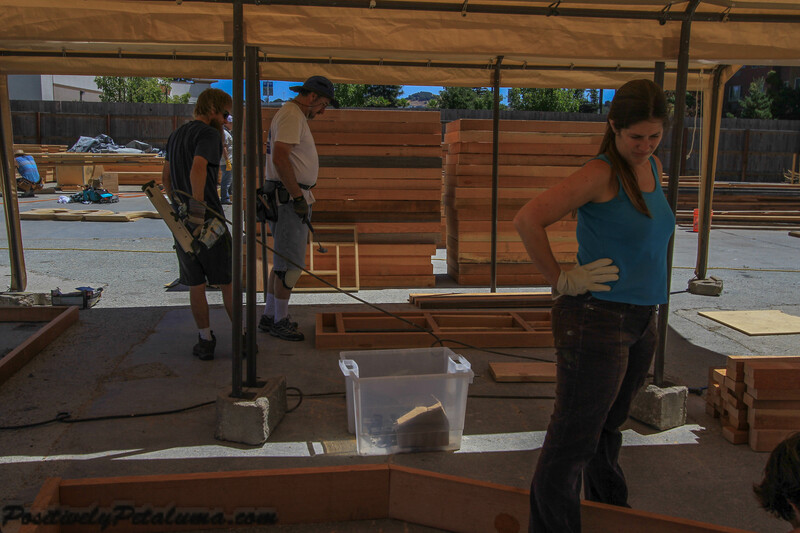 For weeks 40 to 65 volunteers will show up on any given day to work hours into building this structure. Young and old, carpenters, electricians, architects and people just walking off the street asking if they can help. The environment was one that everyone was working together and helping each other out for a common cause. Jules was talking to a taco truck vendor to see if they can be there all week as they have a lot of mouths to feed. He agreed to return for the entire week. So this year when you see the Burning Man structure burning down on TV at the end of the event, you will know where it was build and what this structure means for a lot of people. Here is the video of their Kickstarter campaign. Author Wayne DunbarPosted on July 12, 2014 Categories Featured, News, Photo Album, VideosTags 2014, Burning Man, David Best, Kickstarter Campaign, Petaluma, Temple Of Grace, Where is David Best from?, Where is the 2014 Burning Man Temple being built this year? The SELL 24 million dollars worth of tickets to their gift economy event and then the temple has to be funded by *donations*? I love david best, his works are beautiful. He’s getting older and it must be stressful to pull this off in this timeframe. Not only that but if they are going to pass off the project to him so late in the game why do they not find it?